Johnny was a strange little boy. Even his parents were a bit puzzled by him. He grew up in a small backwoods area where white people were almost never seen. This was the year of the bullwhips and Apartheid in South Africa. He got “religion” at a young age and would preach to the hens in the henhouse as he tended to his chores. He stuttered while he spoke. He even disapproved of his father’s farm work because it was interfering with God’s plan. As a young teen he was given an opportunity to learn with a church volunteer who was visiting the area. Although he stuttered and stammered; and most people, including his parents; thought that he was wasting his time; this woman saw something in the boy. She encouraged him to go further. A few more years passed by and that woman became involved in legal difficulties. The laws of that time and place did not allow his people to learn to read and write. In many churches the local authorities allowed only 1 copy of the Bible. And, they actually came around to check. With only 1 book it would be almost impossible to teach people to read. This restriction was one of the many factors which gave way to “lining”; a practice common to his people; whereby the Pastor would read, or sing a line; and then the congregation would repeat it. When the authorities couldn’t stop the woman from teaching they closed the church and sent her to jail for “moonshining” after they found 1 bottle of beer. Then they confiscated the building, tore it down and sold the church property. Little Johnny, a teenager by this time, was affected greatly by this whole turn of events. And all the while the racial tension in South Africa grew ever worse. You might say that these events informed the person who Johnny would ultimately become. You see, that little boy; Johnny; was John Lewis, future activist and Congressman. He can be seen in the above photo. 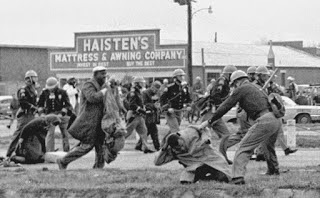 He is the one being attacked by the dog on March 7th, 1965 during the Selma-Montgomery march for the right to vote. You see, all that befell Johnny took place; not in South Africa under Apartheid; but here at home in the United States of America. And the sacrifices made by Mr. Lewis and thousands of other brave men and ensured that later generations would have the right to be heard in the voting booth. As for the woman; the one who was arrested and jailed for “moonshining”; that was Septima Clark, of the Highland Folk School. Now, fifty years later, the rights which these 2 fought for; in the form of the Voting Rights Act; are under attack by people who would have you believe that the need for these protections has passed. Don’t believe that for a second. The new battle for Civil Rights will not be about color. The new battle will be about economics.